Bedwood Hostel i Köpenhamn, Danmark : Boka nu! Good location, atmosphere, friendly staff. Excellent wifi speed. Water from shower slightly too close to the wall. Excellent toilet: clean, well supplied, excellent mirror, far away from everyone else. 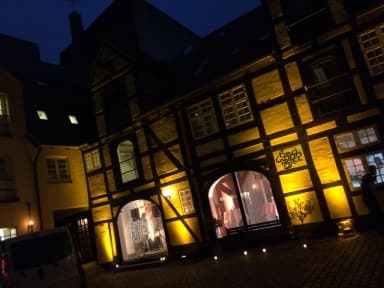 This hostel's in a great location, it's clean, it sits in a beautiful old building and courtyard. The curtains across the beds are a nice touch for privacy. 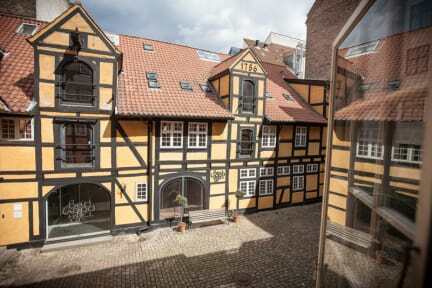 I will book at this hostel in future Copenhagen visits. My only critisism would be that there seems to be an inconvenient toilet ratio. It wasn't a problem in November but I imagine it could be difficult in peak season to find a vacant toilet. I understand that it was probably difficult to do the plumbing in a building of its age. I liked the location very much, the beds where comfortable and you could have your own privacy even though you slept with other people around, because of the curtains. The breakfast was really good and the garden outside was cozy! I don't have anything to complain about, i like the hostel very much and would recommend it to all ages. If you are a lonely traveler, as I was, it would have been nice to have some pub crawls or some activities at the hostel. The hostel was cozy and it’s at a great place. We walked everywhere from the hostel. I also liked the curtains by the bed a lot it gave som privacy. Väldigt mysigt ställe i ett mysigt område! Rent och trevligt. Enda negativa var att rummet som skulle vara 10 bäddars egentligen tekniskt sätt var ett 30 bäddarsrum, så det var ganska trångt och högljutt. Annars var allting bra! Nicely located hostel, nice staff and okay clean considering the price. The thing I didn't like was that the doors to the separate dorms weren't lockable, so basically anyone at the hostel could walk in. The main entrance was also open until midnight so even random people could pop in if they wanted to. Luckily the hostel has small lockers that my bag fit in and I at least felt that my stuff was safe. No air condition either so it felt like sleeping in a sauna. The hostel felt ill managed and the staff where everywhere and nowhere, has great potential but not when i was there. Black mold in the showers for the dorms.